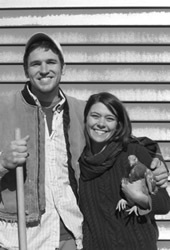 In 2012, we began our first year farming in Rollinsford, New Hampshire. We are leasing a scenic patch of rolling pastures and woodlands along the Salmon Falls River. We are committed to providing fresh produce and wholesome dairy products to the Seacoast region and farming sustainably. We abide by organic practices and treat our animals with respect while they are in our care. Thank you for your support and come by for a visit! It's always worth seeing the animals out on pasture and driving down Sligo Road. Winter: Seacoast Eat Local Winter Markets in Exeter and Rollinsford. We grow a variety of vegetables, including tomatoes, lettuce, greens, cucumbers, summer squash, eggplant, peppers, etc. Our CSA runs from June-October and offers organic vegetables including 7-10 different items per week. We are certified organic. Pick up days are either Tuesday or Thursdays from 3-6pm through the season at the farm in Rollinsford. We offer a meat share as an optional add on. Flower CSA available through Omniflora Farm, Kittery, ME. Bread Share available through Ember's Bakery, Dover, NH.Baer's Best Beans available at the farm store. South Berwick, ME. NH Community Supported Seafood CSF pickup location.